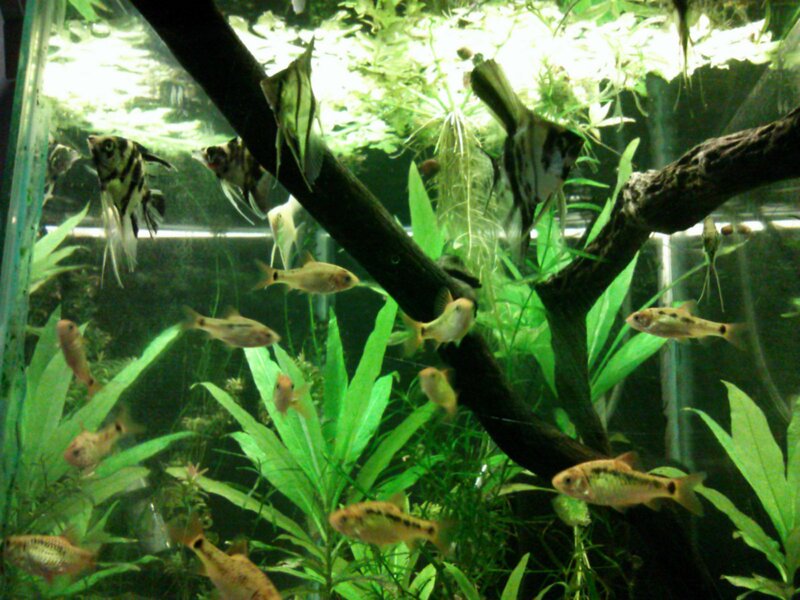 I bought a group of young Gold Barbs at the Fish Club. At the time I didn’t know how many I had purchased. It turns out I have 16 of them! They sold them cheap, it probably worked out to less than 50 cents per fish. 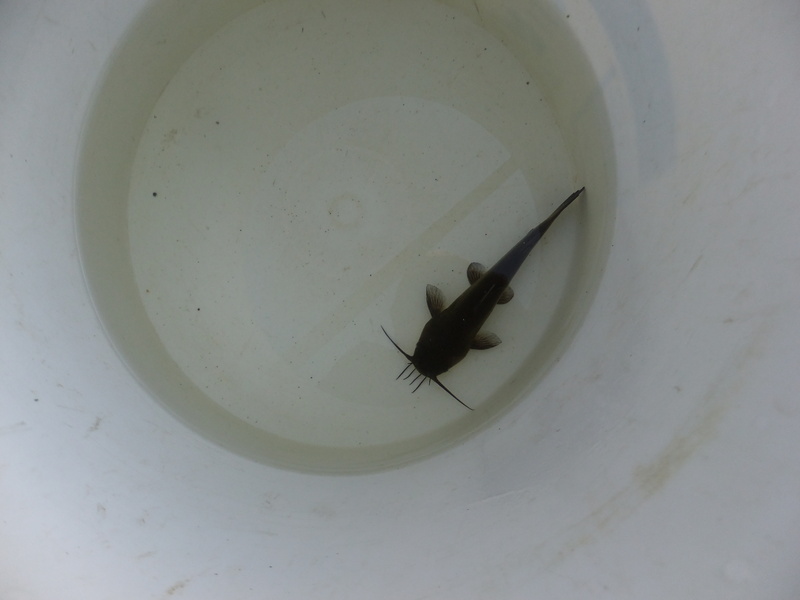 They’ve grown a lot these past few months and I have to say they are a terrific fish. I think they are so happy because I have them in a school. It makes me wonder how many Barbs school together in the wild. Dozens? Hundreds? Thousands? And we put them in tanks, maybe two or three at a time, sometimes all alone!! 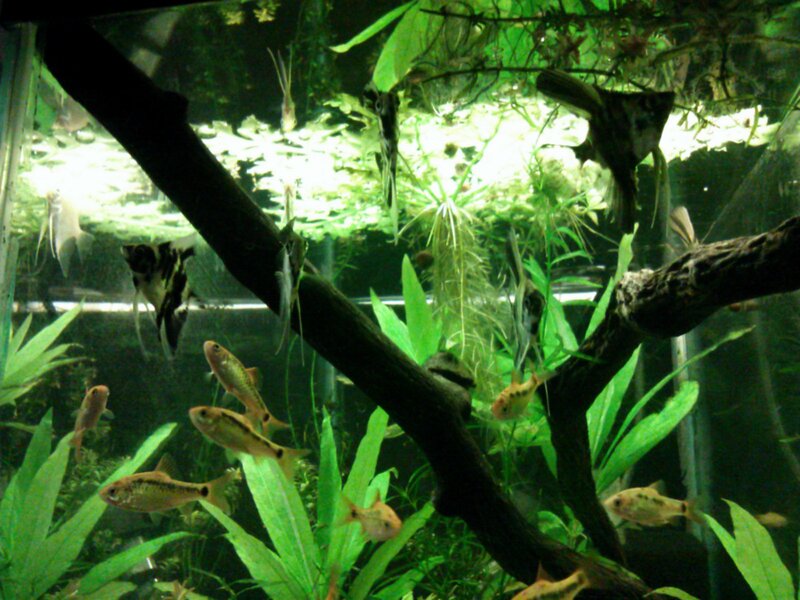 While other fish cruise around the upper levels, the Gold Barb tends to hang around the lower third of the tank. Gold Barbs are only about 2 inches long. 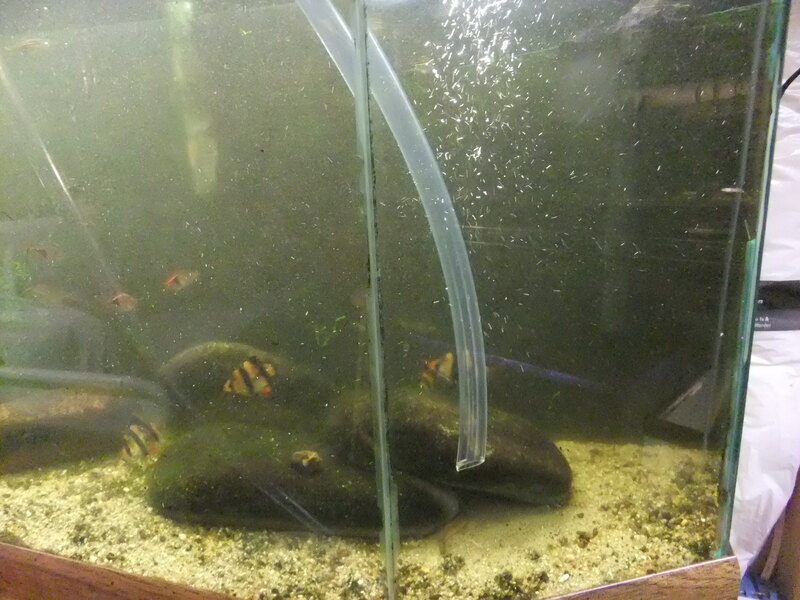 These are sharing their tank with some young Angelfish. 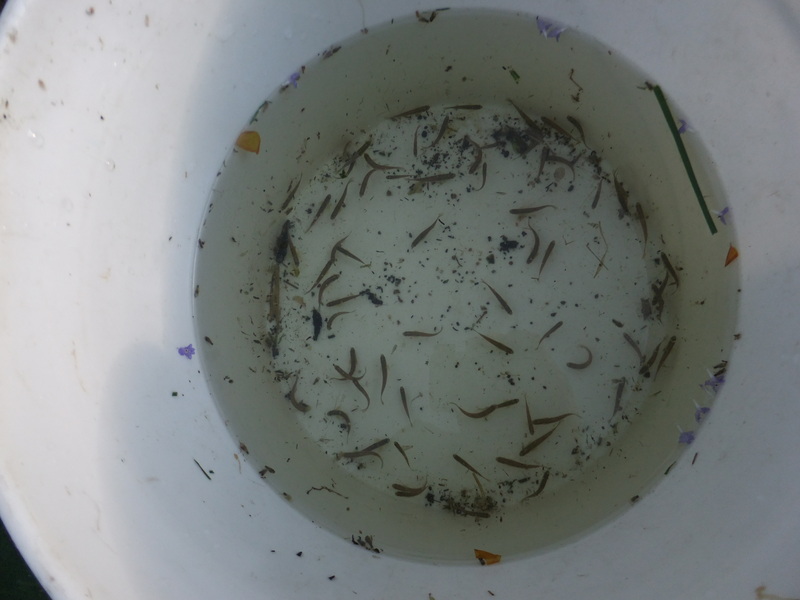 When you can, buy schooling fish in schools! We all have a tendency to buy 2 of everything. Believe me, I have done it. If you are setting up a tank to make a visual impact the way to do it is not with 40 fish of 20 different species but with, let’s say, 35 fish of one species and a few pairs or loners of other kinds. 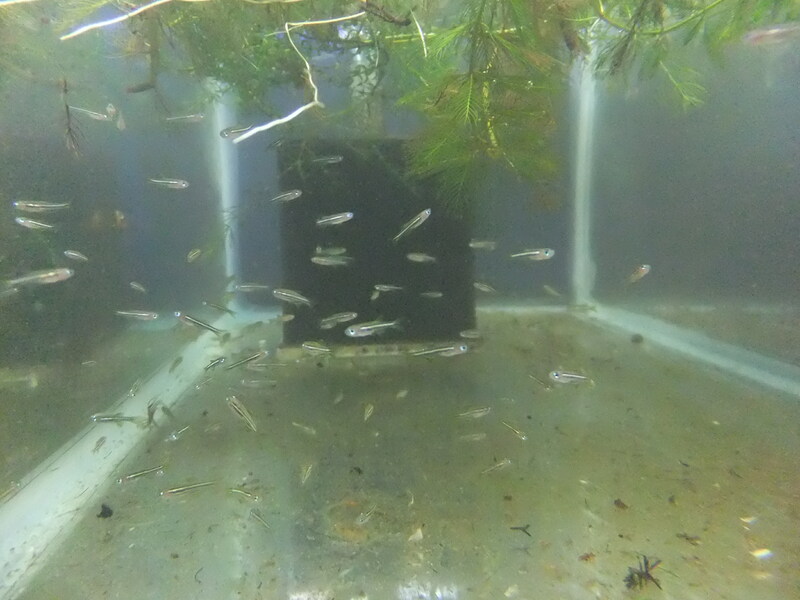 The most beautiful planted aquariums in the world ALWAYS have large schools of fish, like Cardinal Tetras or Rummy-nosed Tetras, or Congo tetras. The possibilities are endless. Well, anyway, don’t forget the Gold Barb. I’m glad to have gotten my little school of them. 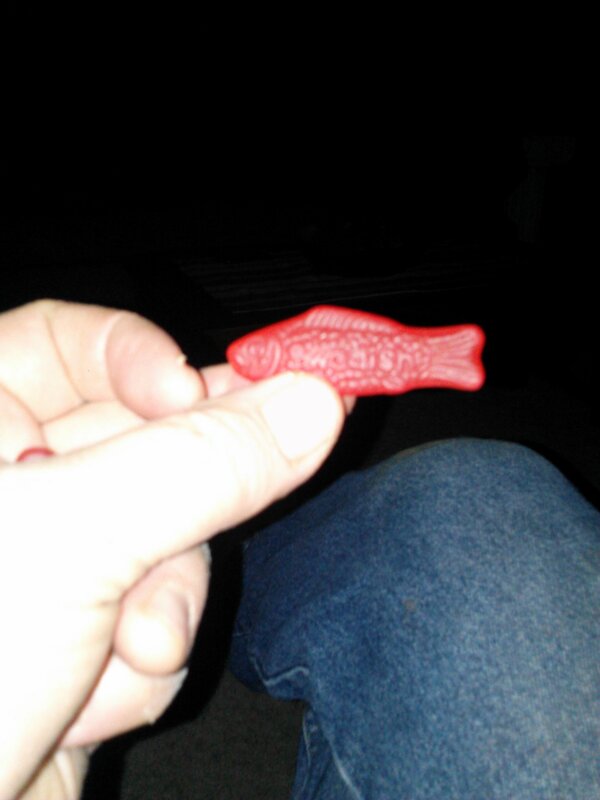 Treat your fish once in awhile. 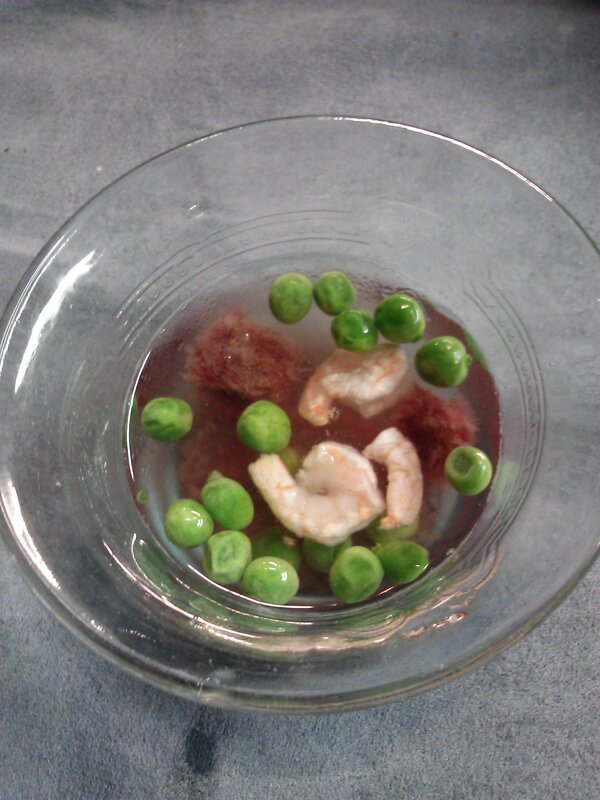 Here’s a bowl of peas, brine shrimp and cocktail shrimp. 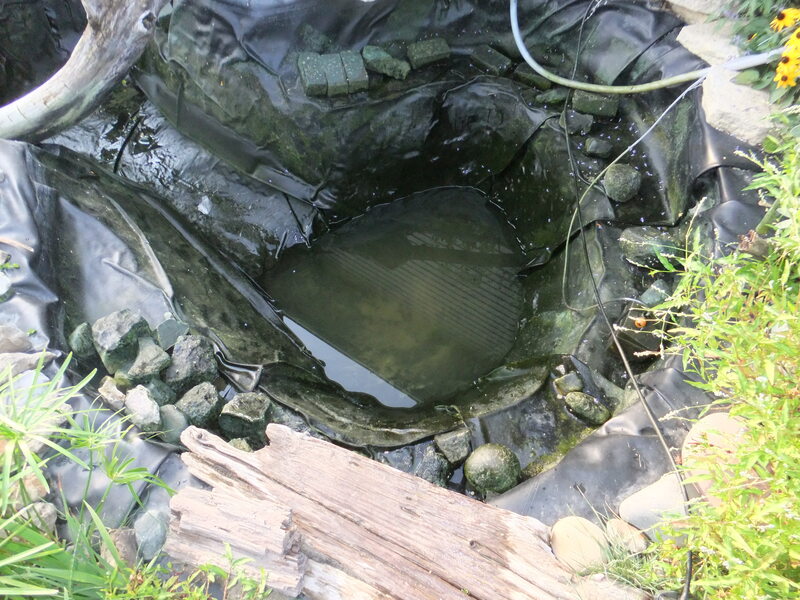 Here’s an extra piece of pond liner that I gave to a friend who might make a pond this year…or next. 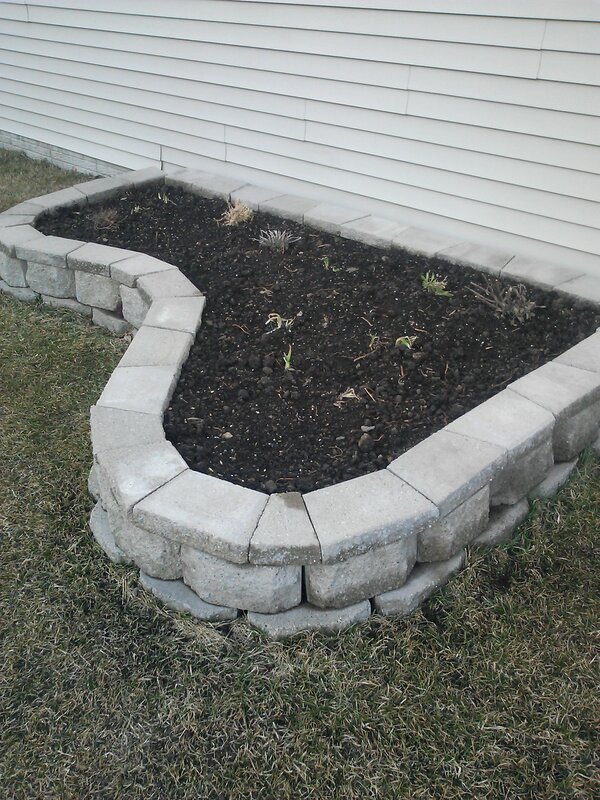 My wife and I lined this planter with strips of pond liner. 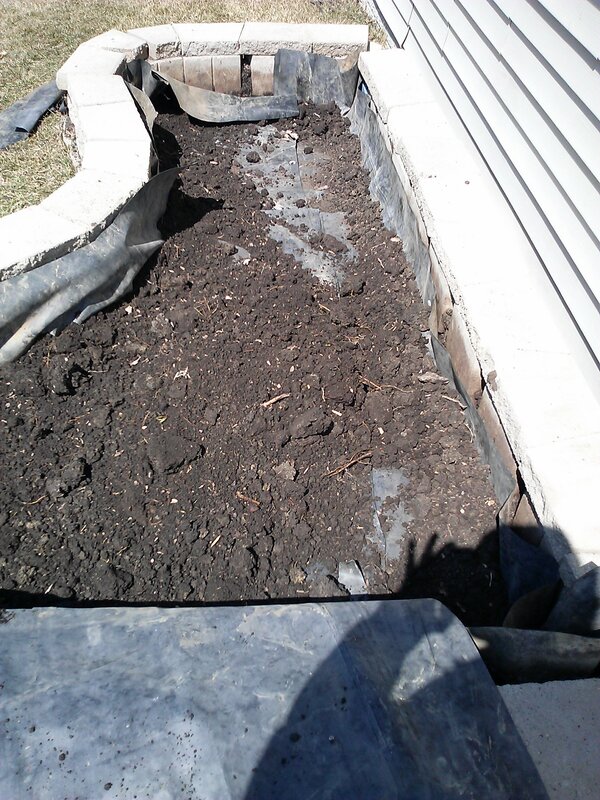 The planter always dries out too fast. 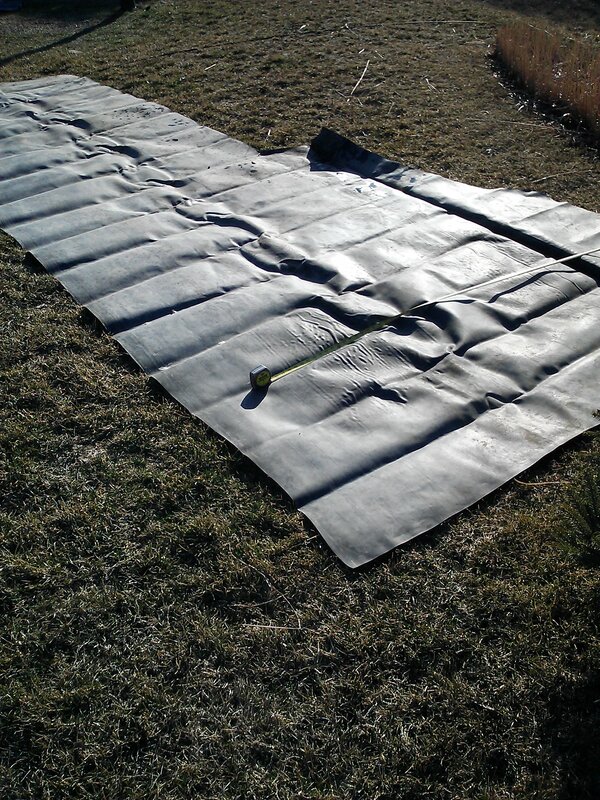 Now, water can drain between the strips but hopefully not too fast. All done, waiting for Spring! 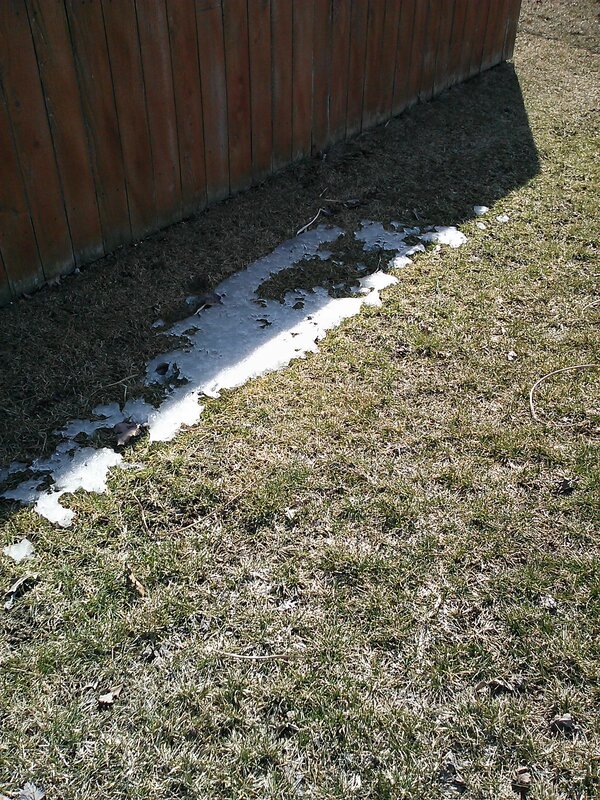 A few weeks ago, the last bit of snow in the yard. 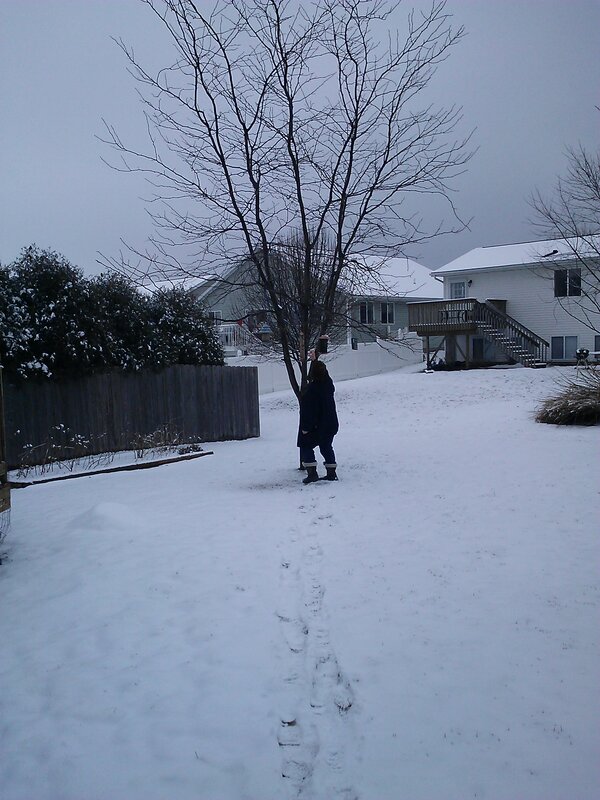 Spring comes, then it snows again. Finally the rains came, and the ponds filled with worms!! 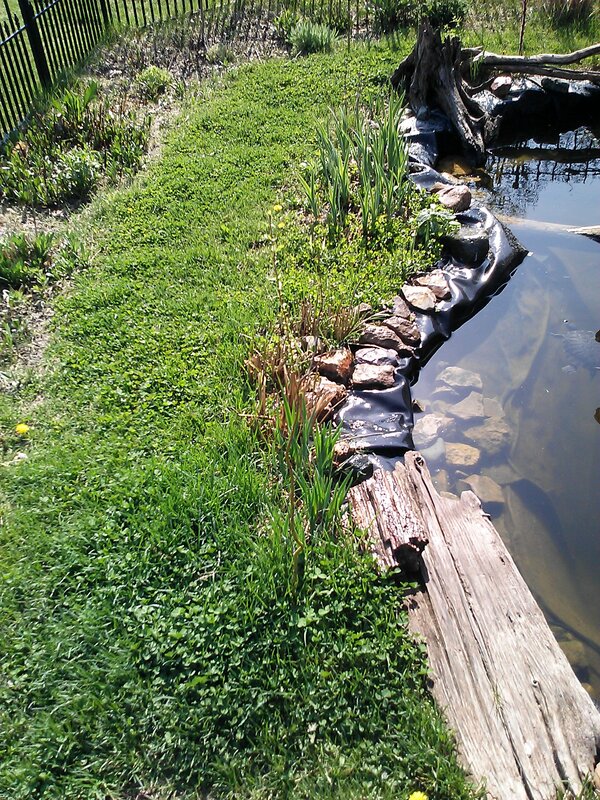 I have netted hundreds of worms from the pond. 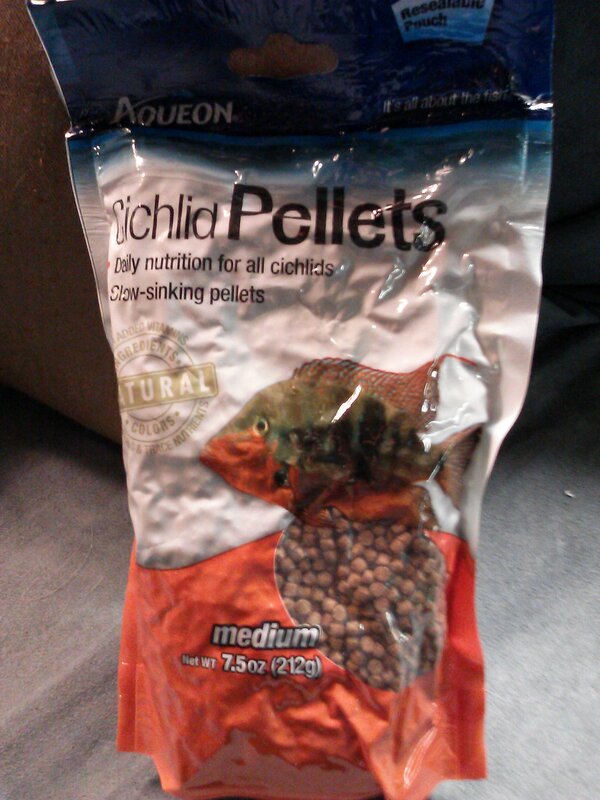 Great fish food, especially for Catfish and Cichlids. 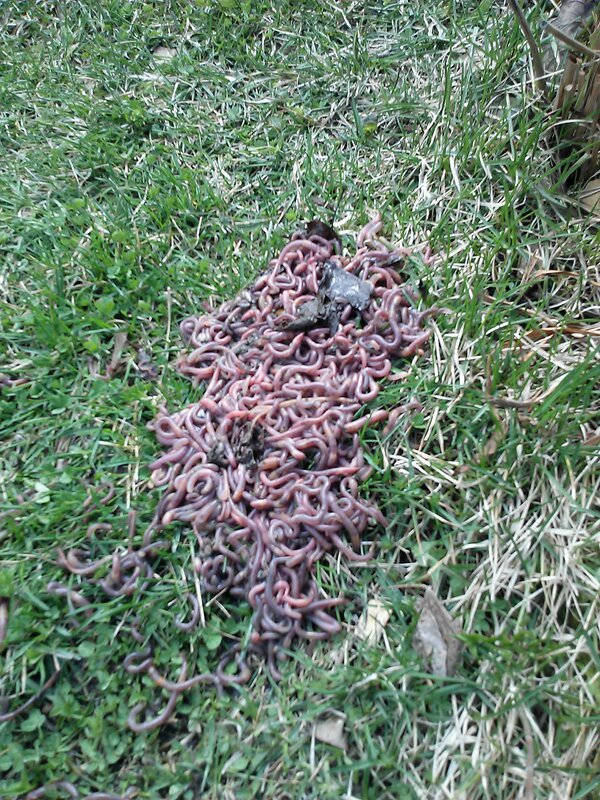 If you poison your yard, don’t feed the worms to your fish. 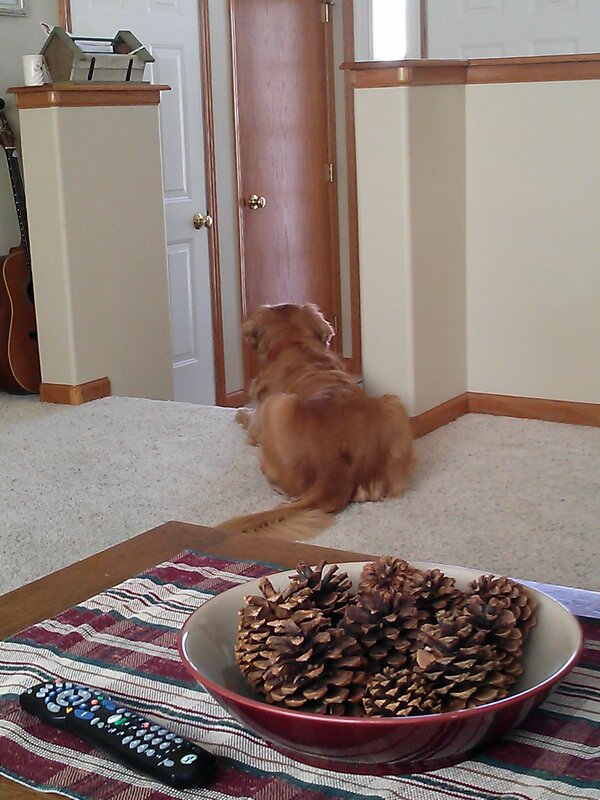 Our Golden Retriever hears someone outside. 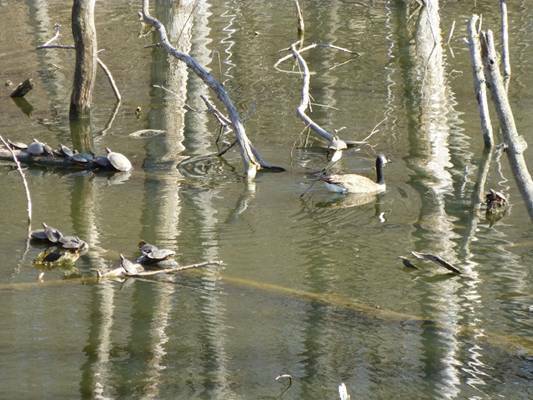 A few warm days and we think Spring is finally here. We have been fooled 4 or 5 times. The Chinese Curly Willow has made it through Winter!! 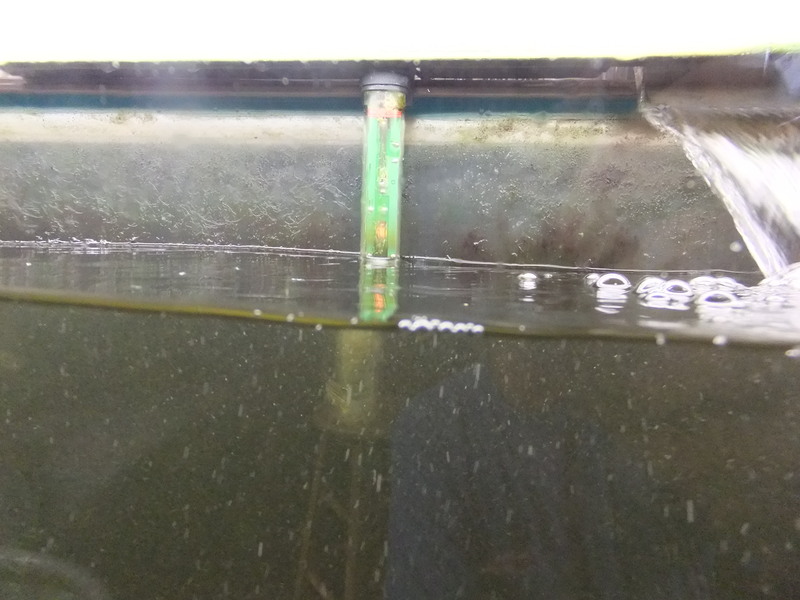 Too much Caulerpa in the Saltwater tank. I took some to a fish auction. 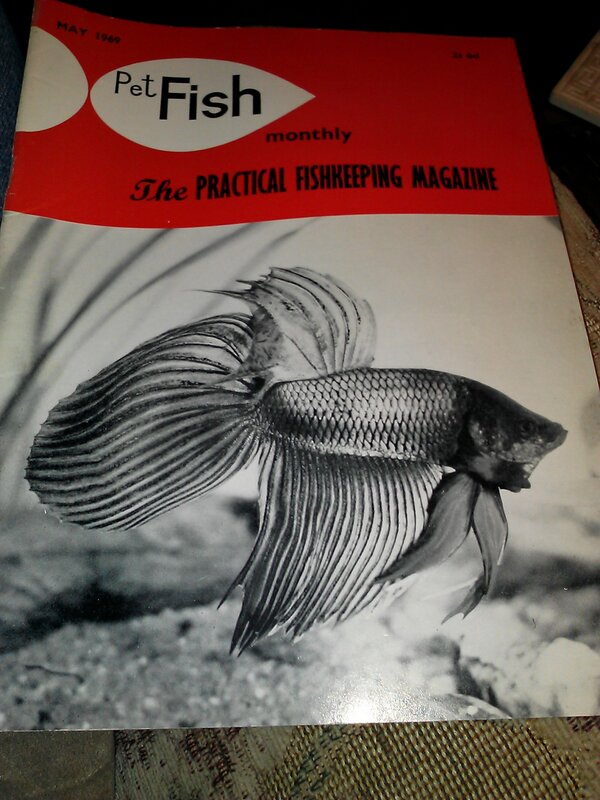 I bought a fish tank at the auction, and some plants, but my favorite purchase was a stack of this magazine from 1969 to 1971. Practical Fishkeeping!! 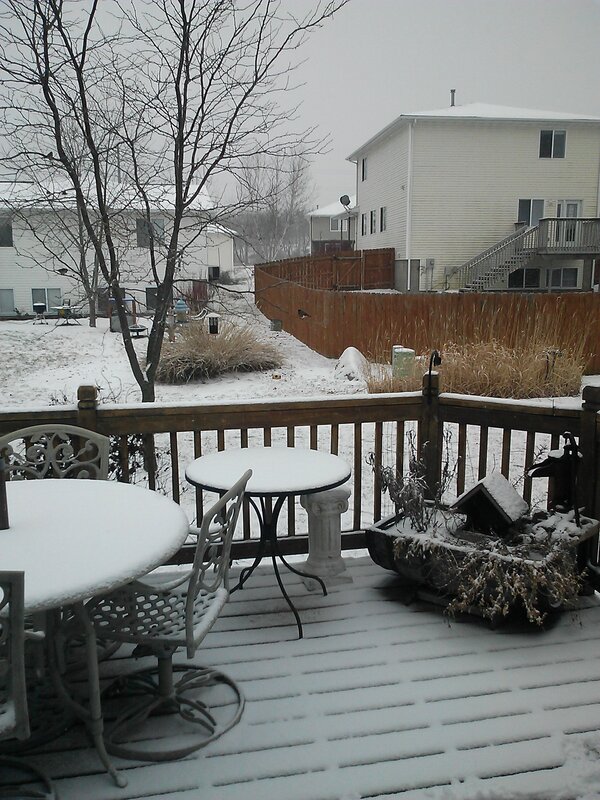 Winter is returning tonight, for the fifth time this Spring. 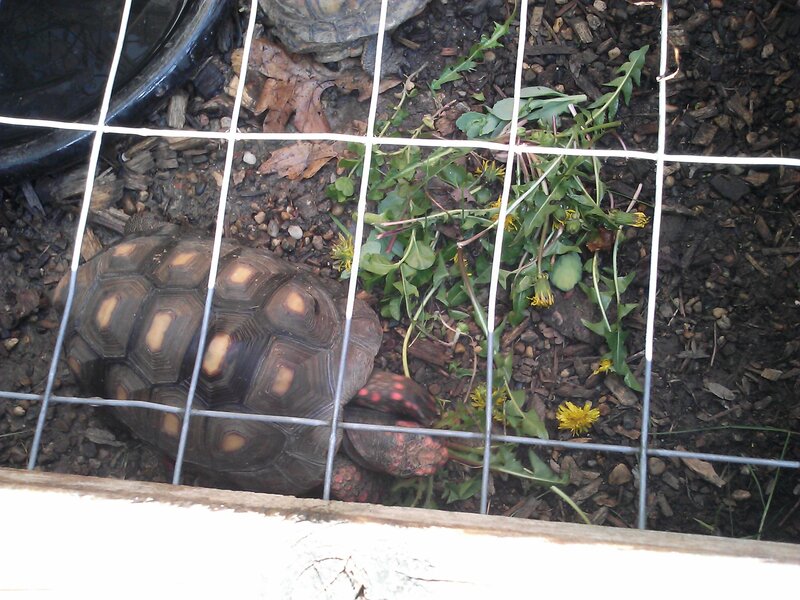 My brother sent me this pic of the turtles in Missouri. But it’s getting cold down there, too. A strange year so far. 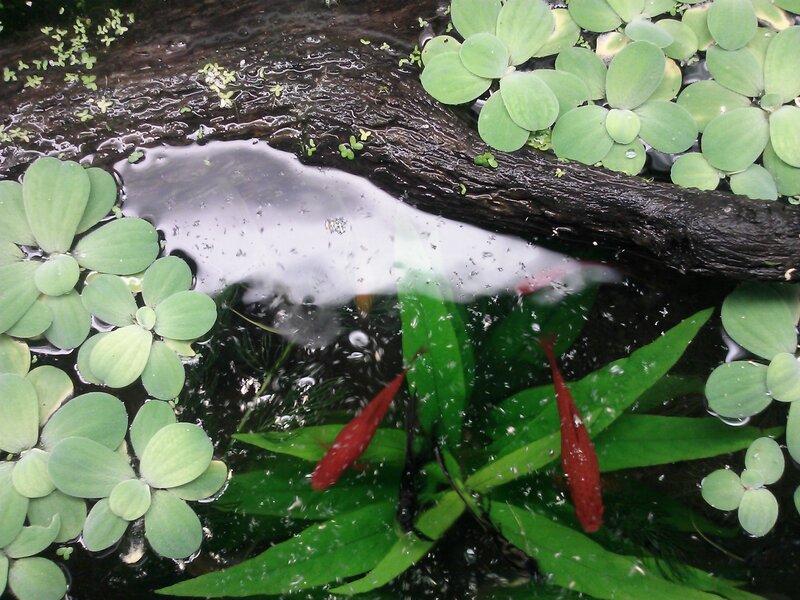 A view of Red Swordtails and young Angelfish from above. A Spring salad today and the snow is coming again. This old girl, who I’ve had for 23 years , enjoyed the day as well. This is coming from a person who never joins ANYTHING! JOIN YOUR LOCAL FISH CLUB!!! I went to our fish club meeting last week. I joined 3 months ago so it was the third meeting I had ever attended. 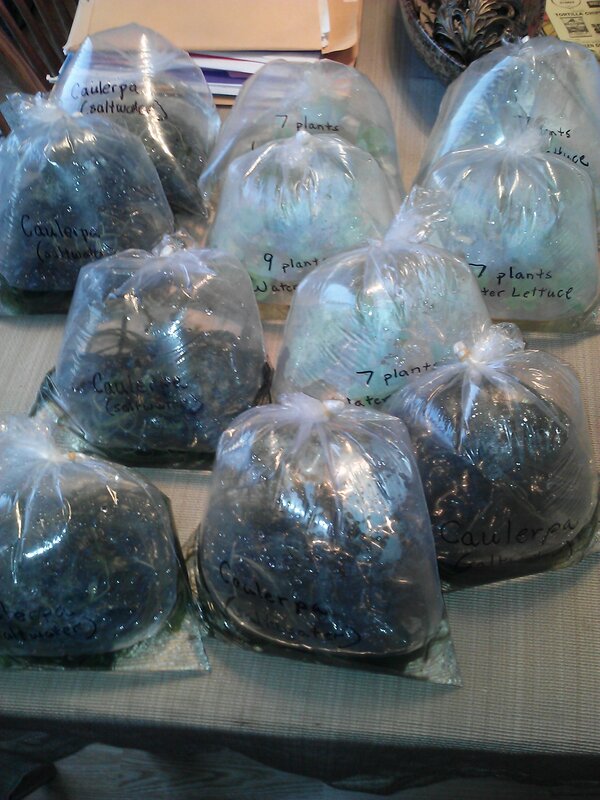 I bagged 12 bags of assorted aquarium plants to sell at the meeting. 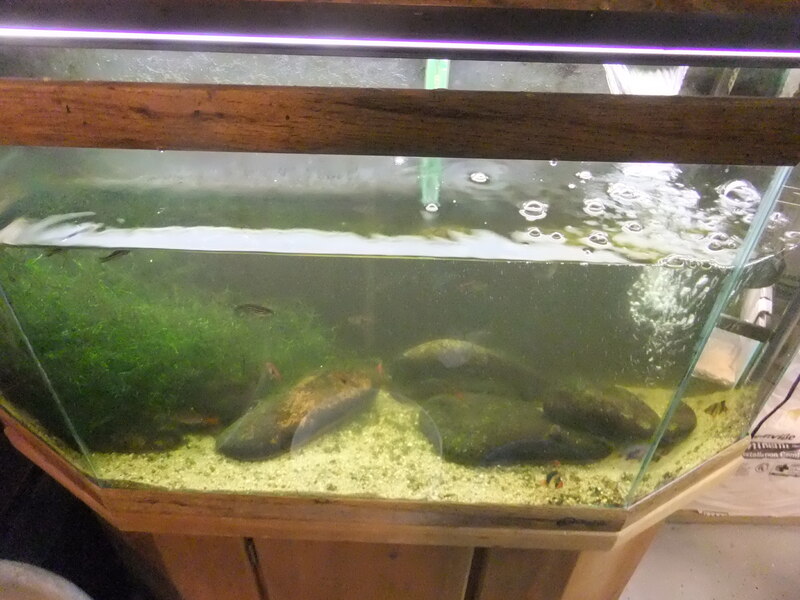 I had saltwater Caulerpa, freshwater Java Moss, Hornwort, and Water Lettuce. There weren’t too many people at the meeting, only a dozen or so. 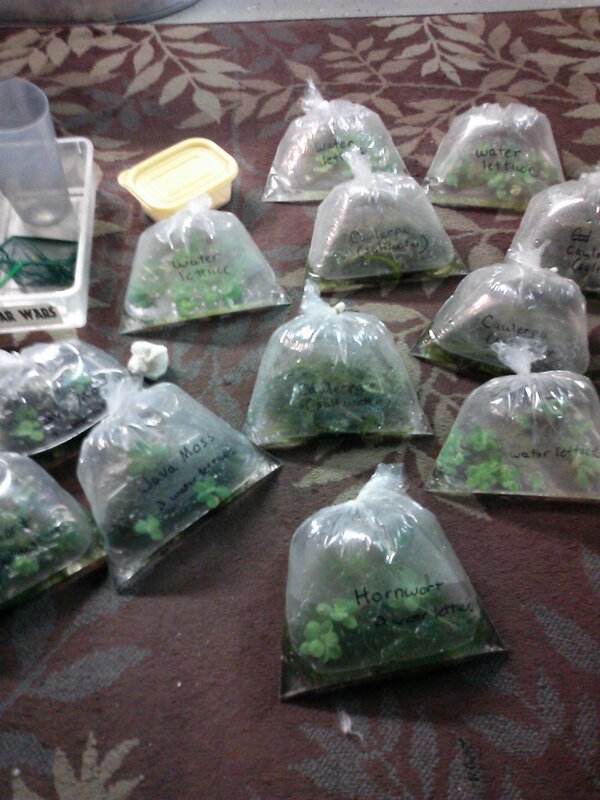 They quickly snapped up the plants for a dollar or two per bag and I donated that to the fish club. Like I always say, I am in this hobby to lose money. Earlier in the meeting there was a presentation on how to set-up a tank for a fish show. Every year, this fish club holds an aquarium show on Easter weekend at a city-owned greenhouse. I’m not displaying a tank there this year. I am a chicken, simple as that, but next year, look out!! I have some big ideas!!! 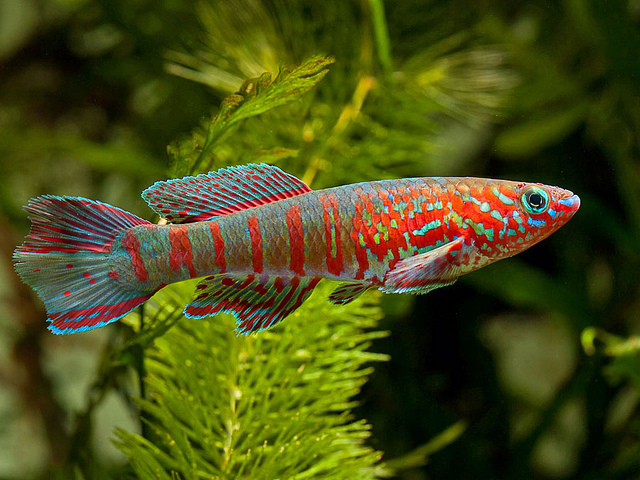 Two members brought in four Dwarf Red Gularis and those sold for $1 each. I’m sure those beautiful fish are worth much more but I knew nothing about them and I have tried to abide by the rule not to buy a fish until I know how to properly care for it. Insanely beautiful fish. If only I had an empty tank!!! Then, a fun part of every meeting is called Mystery Fish. Clues are given about a fish that is hidden in a bag. The clues start out vague and then get more specific until someone guesses what the fish is. The winner gets to keep the fish. At this meeting, a cute little Pearlscale Goldfish was the prize. Finally, the raffle!!! I spent 2 bucks and got 6 tickets. Would I win anything this time??? The first number gets called and…It’s me!!! Over 5 ounces of fish food! Great for Angels, Firemouths, and the catfish love it too! A few minutes later, me again!! 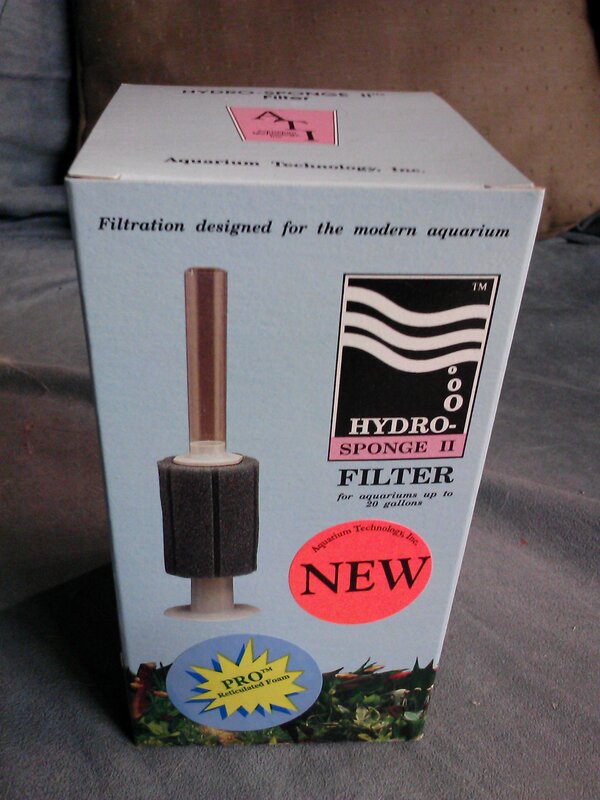 A sponge filter. I love these! Very efficient design. Then, I had a third ticket number called! Once the fish food was off the raffle table, I grabbed this water dechorinator. I’m not especially lucky, I think nearly everyone at the meeting won 2 or 3 prizes. 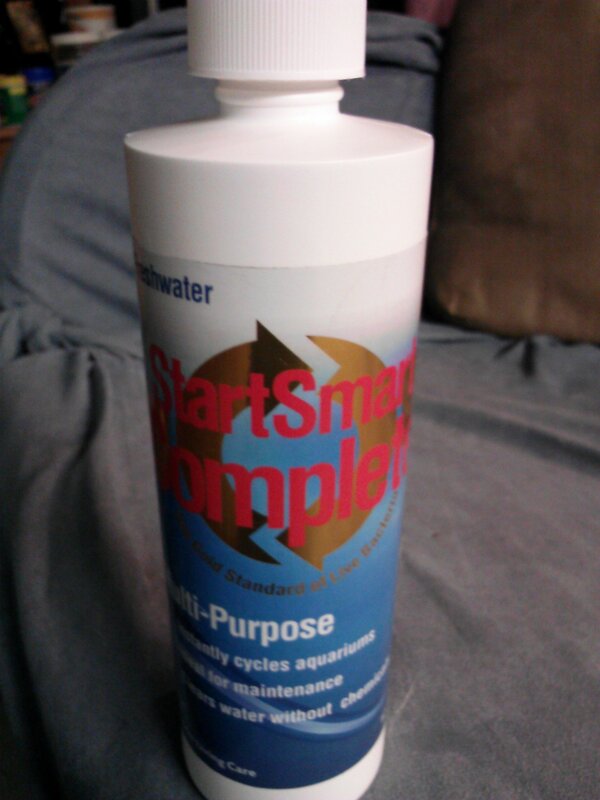 Start Smart Complete is live bacteria that allows you to add fish to a brand-new aquarium without waiting weeks for the tank to go through it’s natural bacteria cycle. You know that TV show “Tanked” where those weirdos set up crazy expensive fish tanks? They set up the tank and throw the fish right in. How can they do that?? I bet they use this Start Smart Complete or something like it. 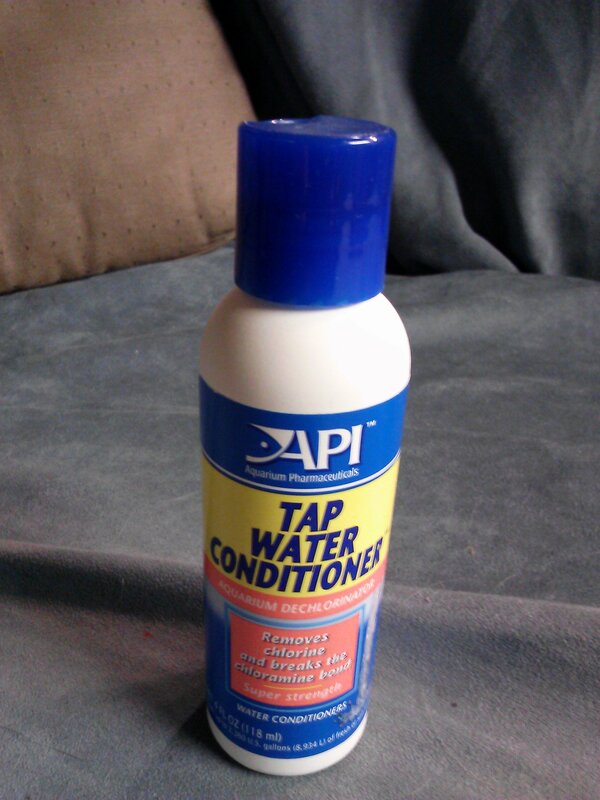 This Spring I will try it in my outdoor 30 gallon pond. 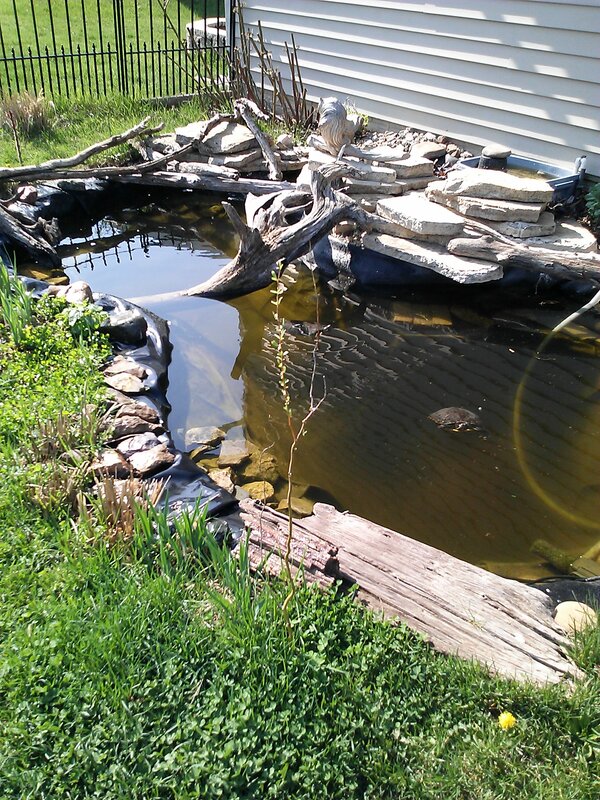 I’ll clean the pond , fill it up, dechlorinate it, add the Start Smart, and put in the fish. 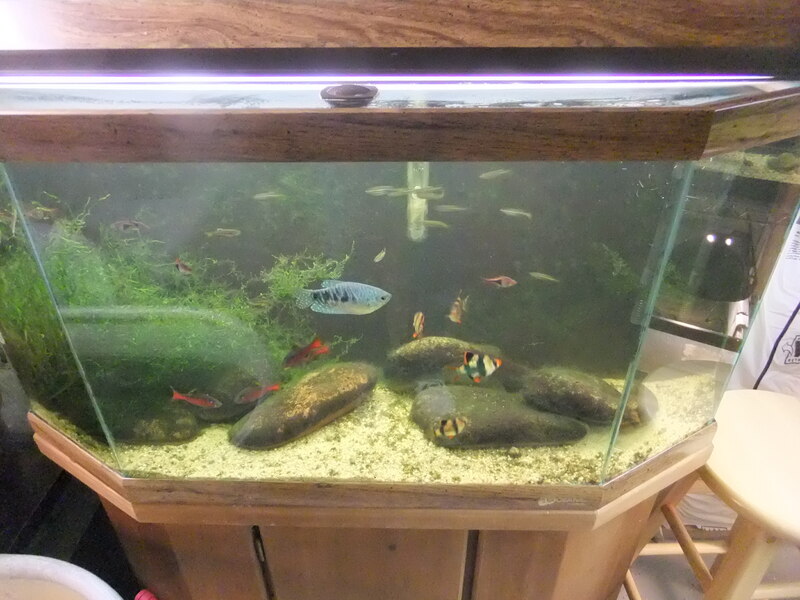 I’ll be adding Velvet Red Swordtails and Marigold Variatus Platies. I feel lucky to have discovered the fun of joining a fish club. The people at this club probably know twice as much as I do about fish but they don’t show off their knowledge , they want to share it. I bet most fish clubs are like that. Try it! A fish tank takes very little time to maintain. I’ve been sick this past week and haven’t done anything to my tanks except to turn the lights on and off and feed my fish. All of the tanks look great! The glass is clean. The water is clear. Daily chores are simple. Turn on the lights, feed the fish 2 or 3 times. Shut off the lights. Of course, you want to have some general awareness about the water temperature and overall health of the fish, but you will be watching your fish so that is easy to do. This tank is about 35 gallons. 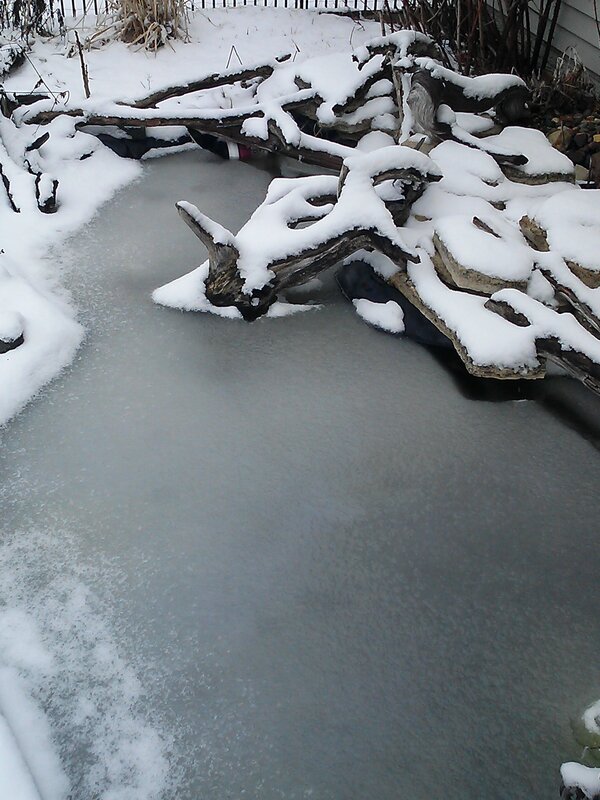 It’s full of very active healthy fish. 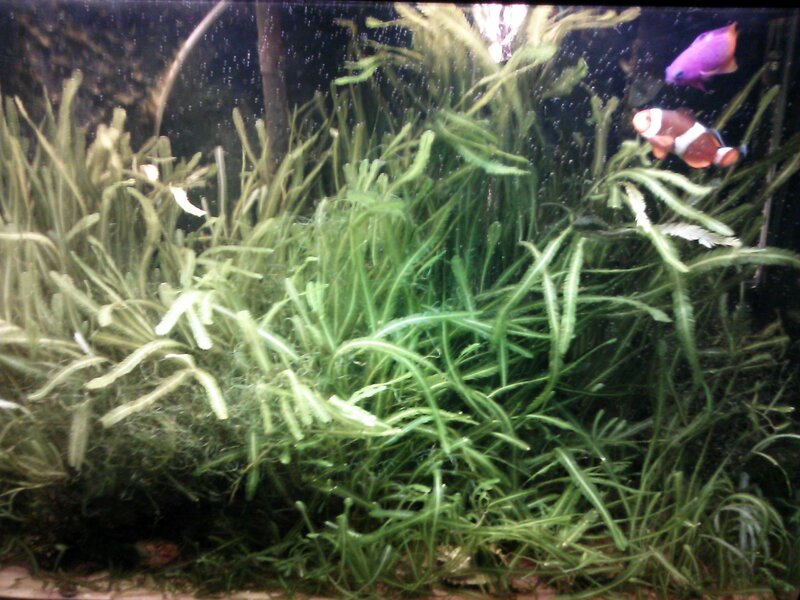 It also has a big clump of Java Moss and a large population of small snails. It will take me longer to write this post than to spiff up this tank. This tank has an outside filter. 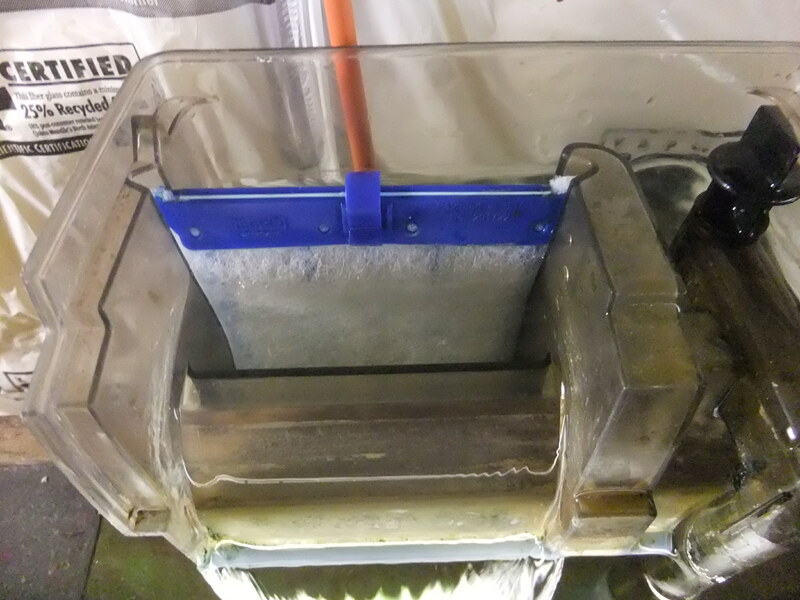 I change the filter pad or just take out and wash the old one. 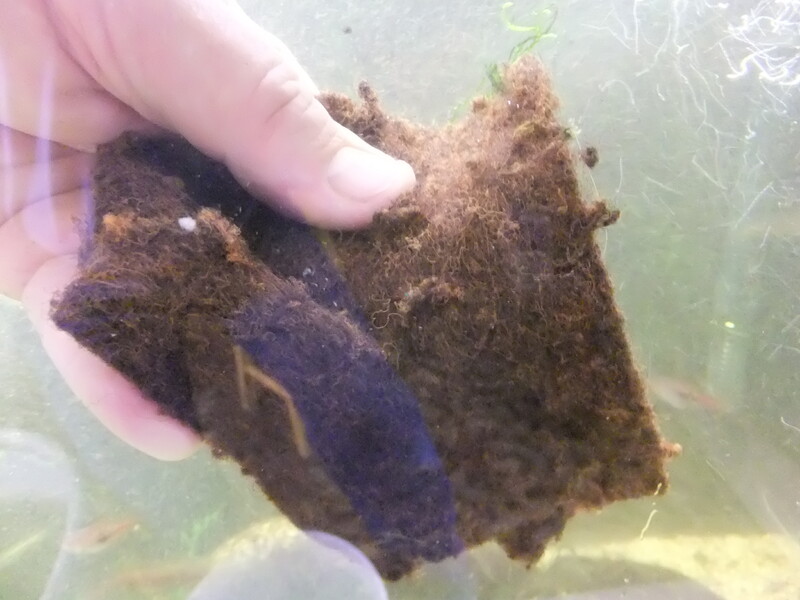 One filter pad can last several months. The water level is already down a little bit so I can reach in and scrub the glass. I think this is an old piece of indoor/outdoor carpeting! Here’s one of the biggest snails in my tanks. The SECRET to my tanks is two things. LIVE PLANTS and SNAILS! I don’t have any Mystery Snails or Apple Snails. I like the little Pond Snails. When they start to overpopulate I squish them and the fish eat them. 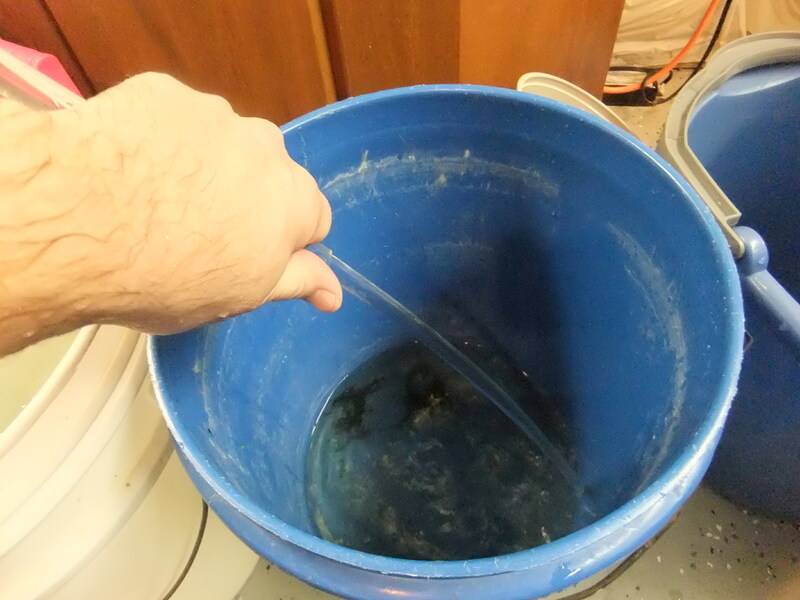 I keep a bucket or two of de-chlorinated water ready to go. 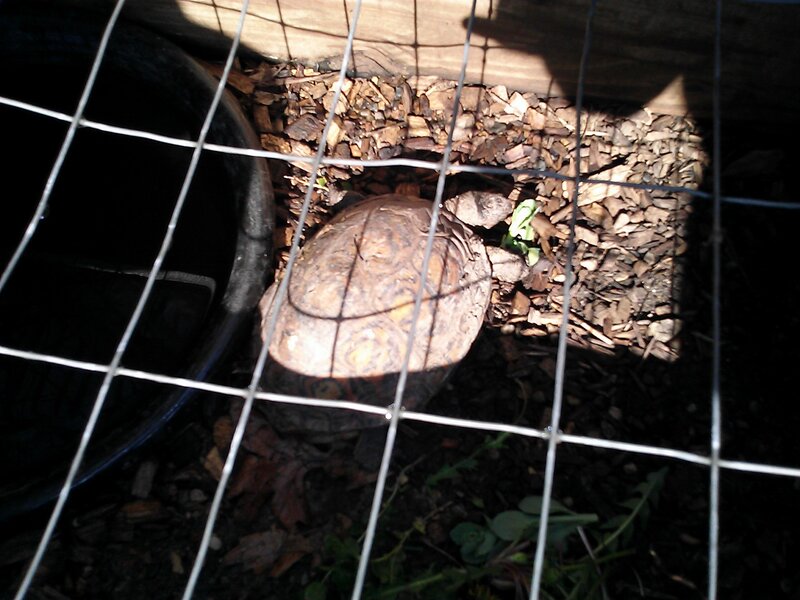 I siphon out about 20 percent of the tank’s water. I do this right after I scrub the glass. 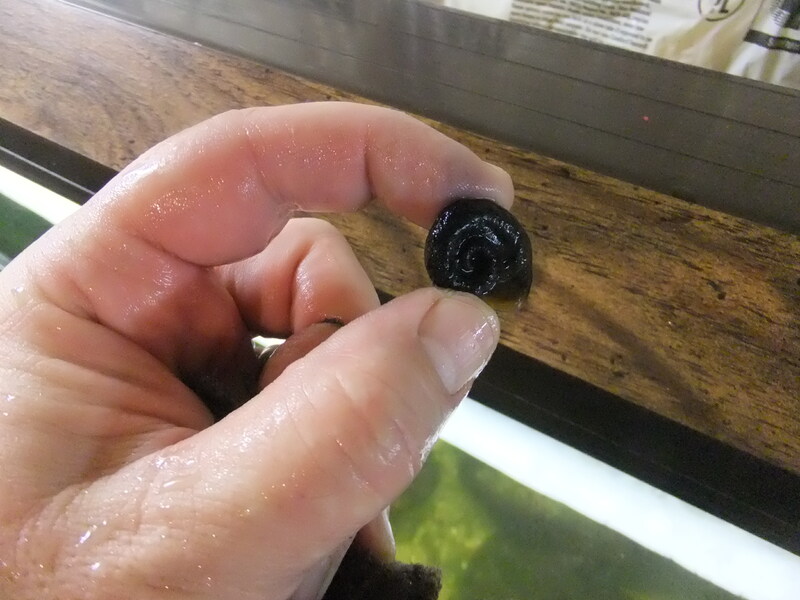 I keep my thumb ready to stop the water flow in case a fish gets too close to the other end. 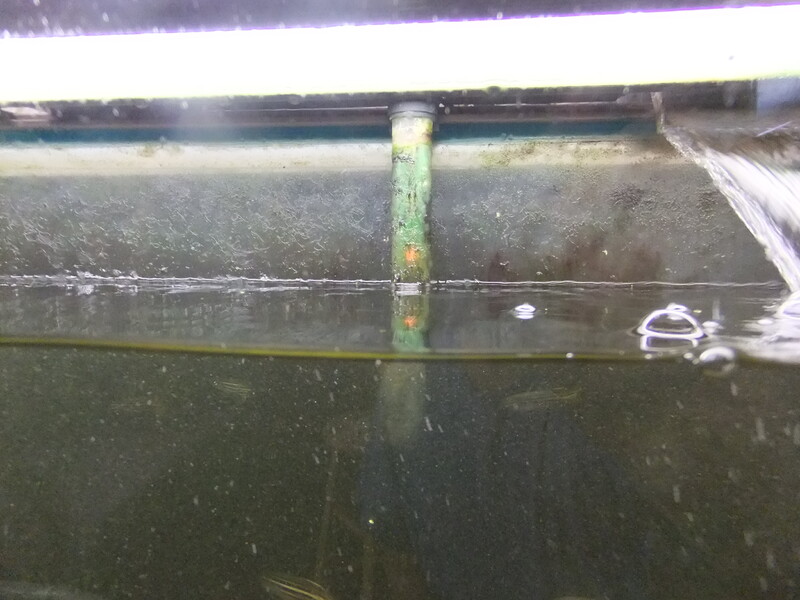 If your heater clips to the side of the tank don’t drain the water down too far. I lightly scrubbed the heater tube. You can see I do things the old-fashioned way. I have heard about a better way to change water without lugging buckets around. It’s a product called a Python. 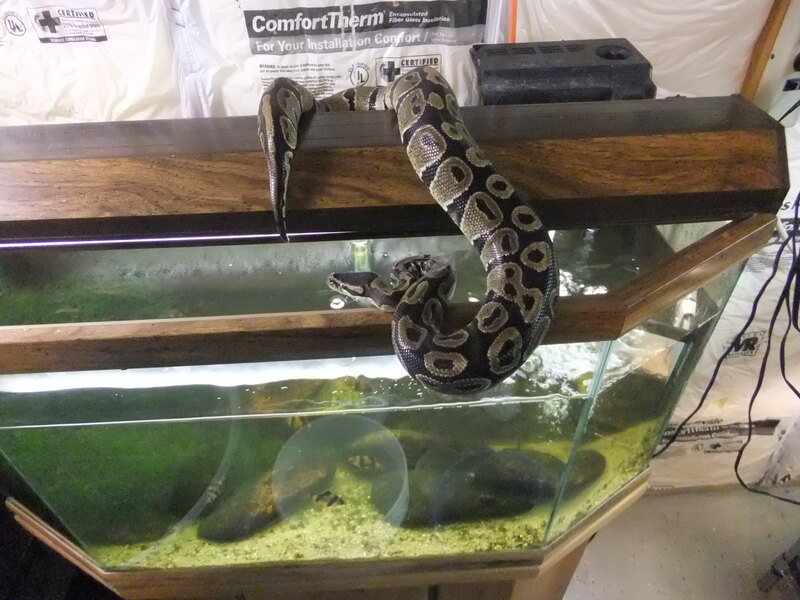 So I went to the Petstore and bought a Python. I hate to say it but it didn’t help at all. I refilled the tank. After a few hours the water cleared up. Cleaning the tank took half an hour. The water lilies have done well in the aquarium. I thought this tank has seemed a bit dark lately. Looking down at a Gold Angel baby.